When I typed the subject line to this article I had goose bumps. This has become an emotional topic for me as incredible experiences and memories now form part of how I rode the Long White Cloud. 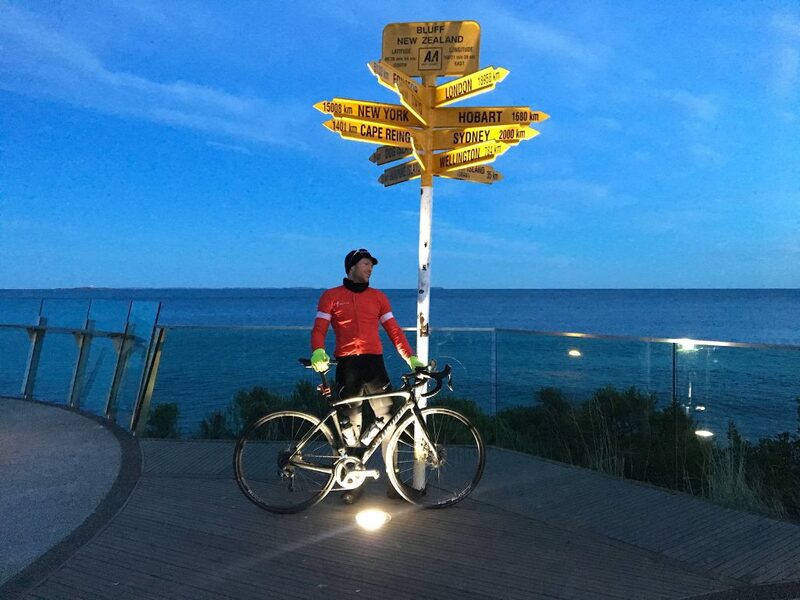 It’s been a couple of weeks since I pulled into Bluff at the very bottom tip of New Zealand after riding 2,336 kilometres in 13 days, and my body has never been through such a physical and mental struggle to recover. I’ve never felt so down, unmotivated and zoned out in my entire life. Only hours ago I received an SMS from my doctor telling me that I should rebook an appointment due to “liver damage” he found in a blood test I had yesterday. Yet, despite my fatigue, I finally have energy to write. I had planned on being on the couch today – kid free finally since returning home – in order to recover. Yet I couldn’t stop thinking about my journey. So instead I’ve opened Microsoft Word for the first time in a month to get this incredible experience off my chest. Find bikes for sale in Melbourne on Bike Chaser. I think you’ll agree with me when I say, we all love to watch a struggle unfold. A team or individual struck down by adversity with a long way to the finish line…what will happen next? Will they make it all the way? I didn’t expect this to happen to me. I was only 3 days into my planned 12-day winter journey across New Zealand. The previous day had been extreme in every possible sense of the word, and now I was feeling the brunt. I started my day with knee pain, commencing from the north side of Auckland where I left early in the morning. I caught the morning ferry with the rush hour city workers, wondering how I was going to travel a planned 250 kilometres to Rotorua. As I got off the ferry and started riding down the road, I got a nauseous feeling in my stomach. The feeling of sickness was coming from a sharp pain in my left knee, exacerbated by rotation at the bottom of each pedal stroke. I started to feel anger towards the owners of a farm dog that had escaped their fencing area the day prior, as I climbed a steep country road. The dog ran straight for me. 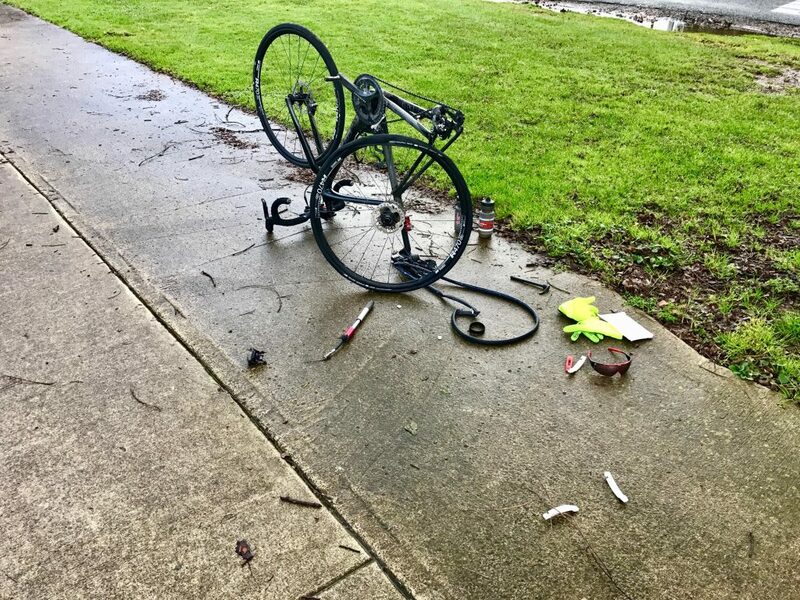 I can’t recall exactly how it transpired, but I scared the dog away though yelling aggressively and jolting the bike through an attempted air kick, in order to push the dog away. My shoe remained attached to the cleat but the aggressive leg movement had left a twinged feeling in my left knee. Being in Auckland with traffic lights stopping me constantly, the pedalling situation was worsened. Every time I stopped and started again it felt like razor blades had replaced the cartilage in my knee. I spotted an acupuncture centre as I was close to exiting Auckland. They could see me almost immediately. I explained where I had come from and where I was heading. I couldn’t rest. I needed to keep going, so they pulled out their instruments – needles, suction cups, and scraping devices – and began their melody. The cups lift the fascia to loosen skin and muscles and also increase blood flow through cupped areas. 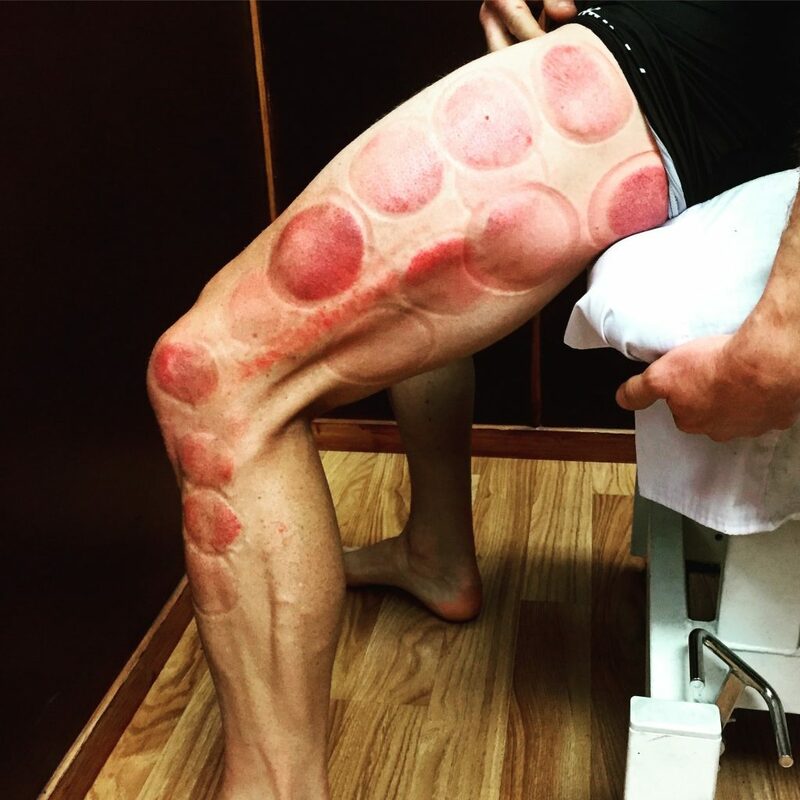 The brutal cupping left me branded with these red rings for days, but it was the treatment I needed to be able to continue. Why did I want to Ride the Long White Cloud? The first time I put the idea of riding the length of New Zealand on the table was a Saturday evening approximately a month and a half prior. My wife Alice was away, but I already knew what her reaction to the idea would be given her unique spontaneous nature. I had been researching for a couple weeks. 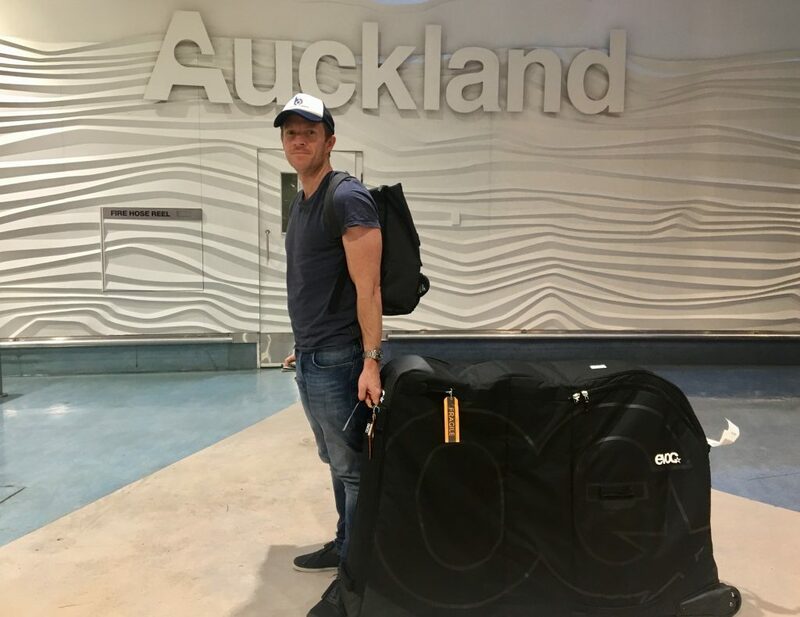 It started off by googling “riding in New Zealand” right through to reading about Craig Harper’s world record – riding the length of New Zealand in four and a half days. While catching helicopters from one island to another, sleeping on the side of the road and riding on the main Highway 1 from top to bottom sounded extreme and intriguing, it was never in my contemplation. 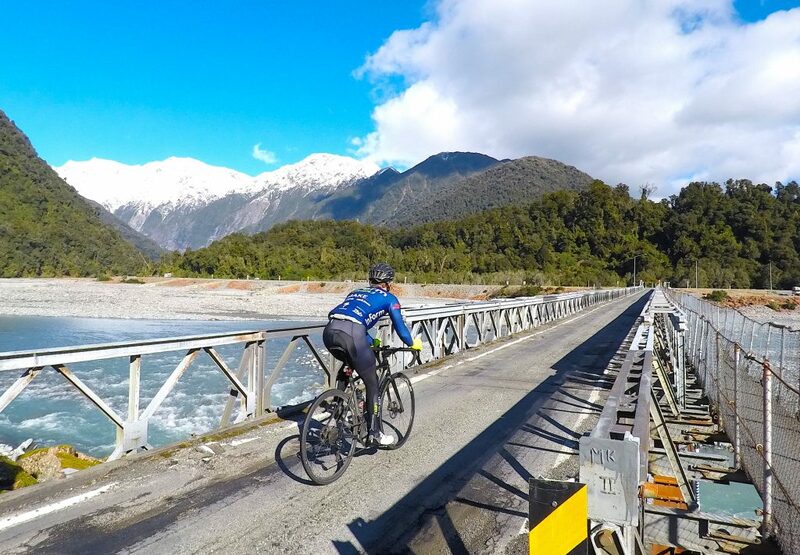 Riding the length of New Zealand at a solid but doable pace, absorbing the breathtaking scenery in the middle of winter; that was my fascination. At the table sat the rest of my family. Mum, dad, sister and brother-in-law, with my two little girls tucked away in bed. I said: “what would you say if I rode the length of New Zealand, top to bottom? I would have to ride 2,400 kilometres over 12 days. 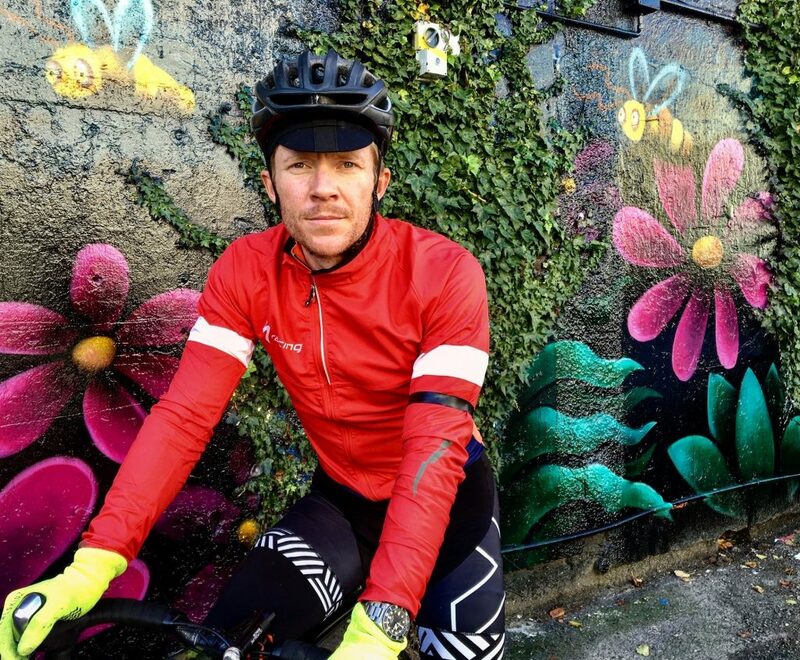 I could raise funds for a good cause and ride through incredible winter conditions, giving me lots to blog about at Bike Chaser”. It should be noted that Alice and I had already been planning a trip to New Zealand for quite a while. It was a husband and wife holiday I had organised 3 years prior, following an email to my mum and dad to gauge their ability to look after my two daughters for a two-week period. I don’t recall the exact words used by my family sitting at the table, but the phrases were something along the lines of “what are you thinking, it’s only a month away”, “it’s the middle of winter”, “have you ever ridden 1,000 kilometres in a week?” and “do you know what New Zealand roads are like?”. My mum is from New Zealand and my dad has spent a lot of time there for family and work commitments, so there was wisdom in their concerns. However, as the conversation went on and a few glasses of red wine softened the mood, I had everyone’s support, assuming I was personally ready to commit. While it has become a bit of a cliché to ride your bike for a good cause, it does change the dynamic more profoundly than I ever anticipated. At the time of throwing my idea on the table, my 13-year-old kiwi cousin, Lachy McIntosh, was receiving treatment for a blood cancer called Hodgkin’s Lymphoma. His diagnosis was a real shock for the family, and while the signs were positive that Lachy’s lump had been caught early and the treatment would be a success, the subject was still very sensitive when I approached the McIntosh family. Despite this, they were on-board and eager to share the message that teenagers should be open about changes in their body, including lumps and bumps, at a time in their lives where they may feel uncomfortable talking about physical changes. Catching these things early vastly improves treatment, as it was the case for Lachy. Fast-forward a few weeks and Lachy’s mum, Sara, and I had engaged sister charities CanTeen New Zealand and CanTeen Australia. I would be raising funds and awareness for these organisations, who deal specifically with supporting young people affected by cancer. I was now locked in. There was no turning back. In six short weeks, I trained for thousands of kilometres, including some back-to-back 600-kilometre weeks, and then a final 850-kilometre week, before I tapered my training. I’d never ridden so much in such a short period of time, and never been more tired and fatigued. “What was New Zealand going to be like?”, I pondered. 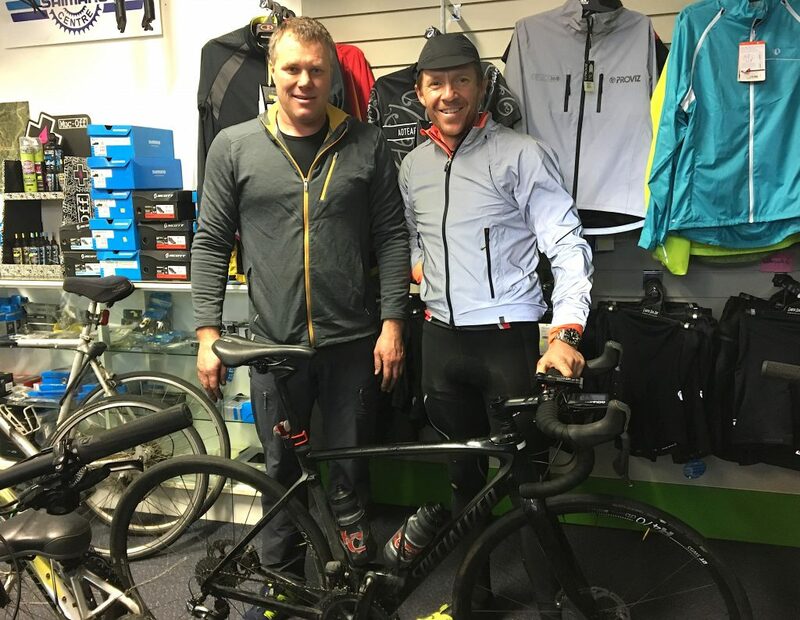 I partnered with seven organisations to help support the ride: 2XU, Specialized, Watches of Switzerland, Bikebox Australia who distribute Schwalbe and Exposure Lights, Icebreaker, Blue Dinosaur and my local bike shop, Hampton Cycles. I was the event organiser, administrator and participant, all on a short timeline. I was so busy and distracted by the logistics that I actually neglected to focus on what really lay ahead, despite constant reminders from others. What would my days entail? What kind of traffic would I face and what would be the condition of the roads? 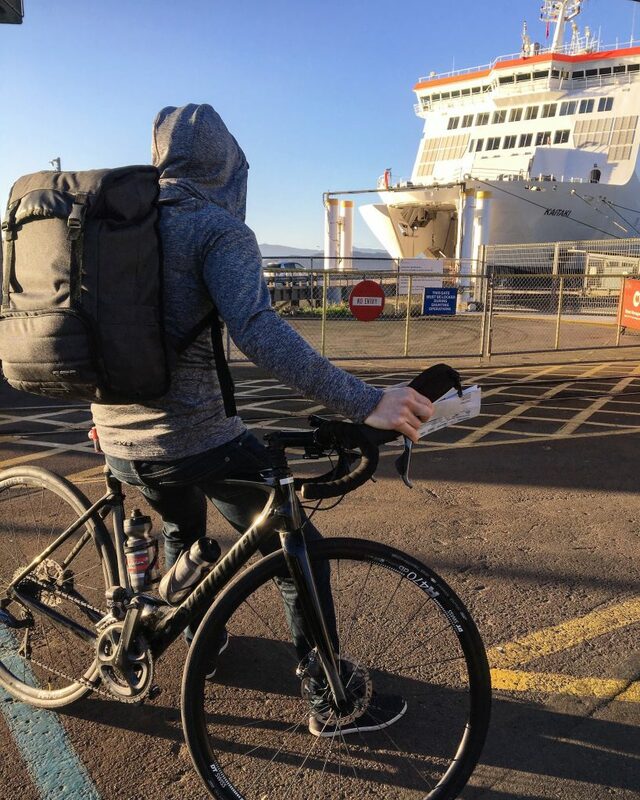 Could I really ride 250 kilometres across multiple days, as per my itinerary? Would some roads be closed because of bad weather and would I therefore have to seek alternative routes? I was too busy and perhaps a little naïve to realise that I was going to take me and my wife on the biggest adventure of our lives. While I would have preferred to have finished my ride with a relaxing family holiday, we happened to be in Fiji in the week leading up to the ride. The Fiji trip had been booked twelve months prior, unlike my decision to ride the length of New Zealand. Alice and I caught a late flight from Fiji into Auckland two nights before the start of the ride. We’d only celebrated our youngest daughter’s fourth birthday that morning and now we were preparing for a kid free duel like no other. We set off to Cape Reinga the next morning, roughly 400 kilometres north of Auckland. As we drove on some winding roads towards Highway 1, Alice started to ponder the challenge that lay ahead. Her spontaneous personality makes her neglect certain details until confronted in the moment. “Are you riding on these roads?”, she asked nervously after some hairpin turns occupied by fast travelling trucks caught her attention. After some further conversation the anxiety subsided. Then we hit Highway 1 – logging truck central. Highway 1 is a one-lane road with a 100-kilometre speed limit and no bitumen over the white line at times. “Are you riding on these roads?”, Alice asked again. “Yes, but I will be looking for any alternative route possible”, I responded anxiously. How insignificant I am compared to the Lighthouse. New Zealand made me feel this way, often. 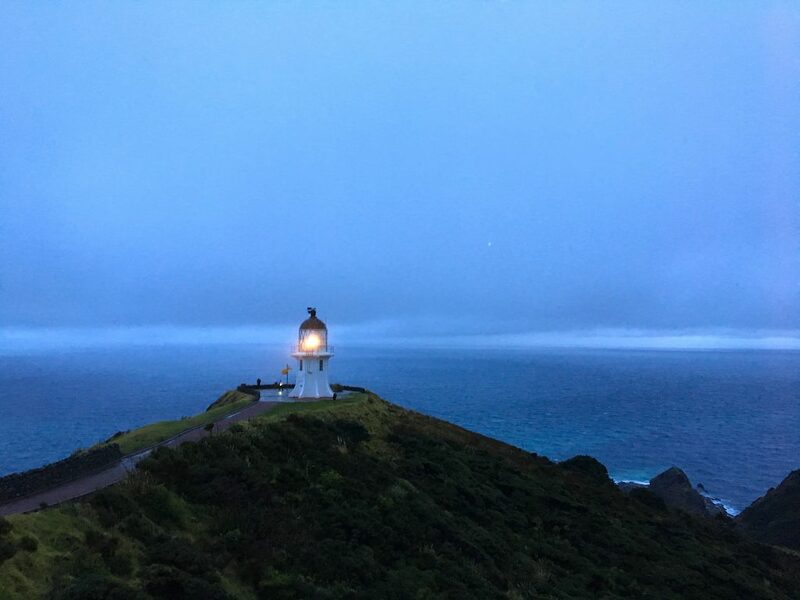 Cape Reinga – the most northern tip of New Zealand – separates the Tasman Sea to the west and the Pacific Ocean to the east. From the lighthouse, at sunrise on Tuesday the 18th of July, I watched the tidal race, as the two seas clashed to create unsettled waters. That first morning was quite surreal, given the build-up. But watching the waters clash was a stark reminder of where I was and my upcoming journey across New Zealand’s extreme terrain. However, day one was rather uneventful. 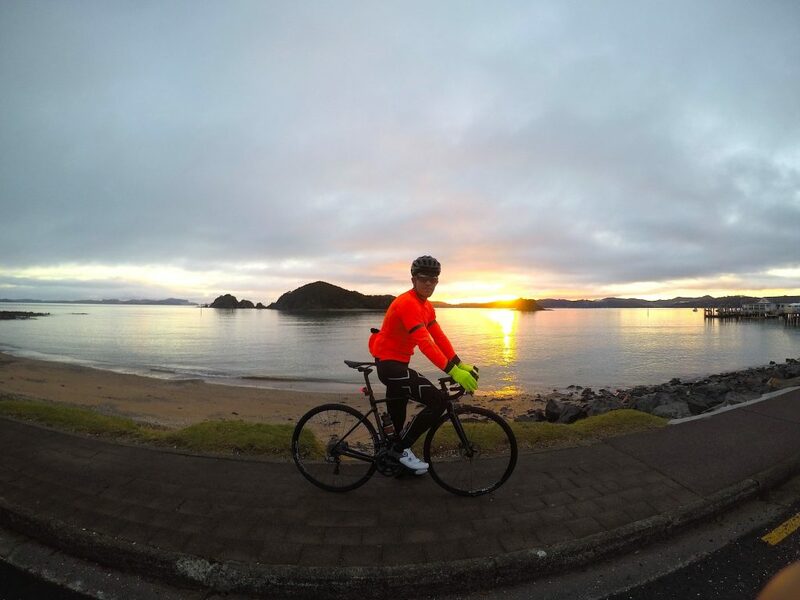 It started rainy and windy, but I made it to Paihia, 217 kilometres from my starting point, just as the sun was setting. Alice and I then strolled off to dinner an hour after my arrival. I made some BIG mistakes on day two. It made me a lot wiser for the rest of my journey, but at that point in time, I’ve never felt so many vulnerable moments in quick succession. About 90 kilometres into day two, I’d ridden from Paihia to Whangarei. Alice met me at Whangarei for brunch. We ate and then went to a bike shop. I needed a pump as we’d left mine in our accommodation just outside of Cape Reinga. We asked the shop owner how we could avoid Highway 1 to Auckland. He showed us some different options on a map. I took mental notes and off I went. There was no way of missing Highway 1 for the first 50 kilometres though. The bike store owner suggested that Alice should sit behind me with the hazard lights on, but I insisted that Alice should at least have another coffee and catch me down the road. The following 20 kilometres of Highway 1 was the scariest stretch of road I’ve ever ridden on. At times I was riding on a white line with MASSIVE logging trucks passing me at 100 kilometres per hour. They would vacuum me towards them as they passed, despite the wide berth. Where there was some slight shoulder on the road, I was constantly in the rough. On one occasion there was so much gravel over the white line, I lightly skidded out onto the road. Thankfully nothing was passing me at the time. Then I got my first puncture. I was half way through sorting out the tyre when Alice drove up to me. We concluded the tyre pit stop as a team and Alice drove behind me for the next 25 kilometres, protecting me from the logging beasts. It made me feel safe, but I rode as fast as I could to get off Highway 1 as quickly as possible. We left the highway for some quieter roads and Alice followed me for another 20 kilometres or so. As we stopped for a coffee and a snack I told her to head into Auckland. “I’ve got it from here”, I said. I had with me two iPhones: an older model with a New Zealand number, and my Aussie phone. When I finally reconnected with Highway 1, I pulled out both phones. I’d left the hotspot on in my rear jersey pocket since the coffee stop and it had chewed the juice. Both phones were redlining well and truly below the 10% alert marker. I decided to use my limited battery to generate a suggested map for my Wahoo bike computer. I selected the suggested route without even analysing it. I didn’t want to risk the iPhone battery dying while the map synchronized using the energy guzzling Bluetooth feature. The route downloaded from the phone application directly to my Wahoo, and then my New Zealand iPhone died moments later. I then quickly flicked my Aussie phone over to roaming to check the map manually. It shut off as I opened my maps. It turns out that I’d missed a turn off 10 kilometres up the road. My Wahoo was about to take me on a wild goose chase, unbeknownst. I had a decision to make as my dear friend, the sun, was close to setting. Did I want to take the direct route on Highway 1 or did I want to follow a route suggested by my GPS on my bike computer? I chose the latter. I went directly over Highway 1 onto a gravel road. I zoomed out the map on my Wahoo and saw a connecting road perhaps 5-10 kilometres down the road. That must be a sealed road, I hoped. The gravel road was undulating and the sun was disappearing behind the hills at times. I was in farming area and I could hear farm dogs barking aggressively in the distance. They were probably hearing an unfamiliar, softer, and much slower crunch on the gravel roads beside their lands. I was starting to feel vulnerable. Where the hell was I, how far was Auckland, and where was the Wahoo taking me? I finally rolled into the intersection that produced some welcomed sealed roads. What a relief. The sun was disappearing and so were my glycogen stores. I was starting to feel hunger flat. It had been roughly 50 kilometres since I stopped with Alice, and I’d seen nothing since. Not a town, petrol station or shop. I should have had extra energy bars in my rear pocket. Another mistake I made that day, which I would never make again. Moments later the farm dog incident occurred. The shock lifted my adrenaline and disguised my hunger flat for a little while, but it was a short-lived boost of energy. The sun was now gone and left me with only a fading light in the sky. I had roughly 200 kilometres on the clock and was running low on energy. I decided to stop at a farm house that appeared to be dog free. At the door I met a lady with a surprised look on her face. I quickly explained that I was out of phone batteries, had no idea where the next town was and that I’d been riding for 200 kilometres. I was desperate for some food. The lady told me that the next town, Kaukapakapa, was 18 kilometres ahead and it would have a fish & chip shop and a pub. “No, my kids left home a while ago, so no muesli bars here”, she responded, with her look indicating that I wasn’t getting anything. As I left her driveway, she called out: “be safe out there, these roads can be scary at times”. No offer of food and a verbal punch in the face. Thanks for that. It was now pitch black. I was on undulating country roads with a 100-kilometre speed limit and I was running really low on energy. “If only that lady knew what a hunger flat felt like”, I pondered. I would have taken a mouldy piece of bread at that stage! I’d even been patrolling for a fruit tree before the sun had completely gone. I’ll never forget the next 18 kilometres. The good news was that I knew how far I had to go, but I was struggling. The roads were incredibly undulating. I battled up hills and came down with extreme caution. I was completely unfamiliar with the roads, it was pitch black, and cars were zooming past at incredible speed. Some tooting, making my emotions heightened. I was yet to play with my Exposure Lights, provided by one of our partners, Bike Box. I flicked the mode from non-flash onto its highest beam. It was impressively bright, like a high beam on a car, exposing the dark, unfamiliar roads that lay ahead. I can’t tell you how happy those lights made me feel at that point in time. As I rolled into Kaukapakapa, a town on the outskirts of Auckland, I noticed the pub. As I entered, a table of drinkers looked me up and down and asked if I’d “finished my ride”, in a condescending way. I explained that I was on my way to Bluff and riding for charity. One of the blokes at the table said he heard about my story on the news the previous night. The conversation opened up and we had a great old yarn. A lovely couple offered me their phone so I could contact Alice to let her know where I was. I recharged my phone and my body with a pizza and a Lemon & Paeroa soda. The city of Auckland – filled with its glorious street lights and plethora of amenities – was just 5 kilometres down the road. From there it was a quick weave down to my cousin Sara’s place in Rothesay Bay, North of Auckland. Alice was relieved to have me back, alive! During my journey I paid tribute to family who had passed tragically in my lifetime. Riding in and out of Auckland I wore 2 armbands to remember my Aunt Valerie and Uncle Bernard. On the morning of the fourth day I really started to feel the pain of the stretched ligament in my knee. I had given the ligament a really solid pull in my attempt to kick off the attacking dog. I’d never ridden with an injury before – why would I? I’m not paid to ride a bike and it’s a little silly to do so when your body requires rest. I’d also never ridden in hail for similar reasons. But I felt the pressure. I was raising money, I had partners and sponsors on-board, I had set expectations with everyone I knew, and had it all planned to an itinerary over 12 days. I’d already lost some time the previous day dealing with severe knee inflammation getting across Auckland. When I took off from Pukekohe, a town roughly 30 kilometres south of Auckland, I started to feel a sharp pain in my left knee, especially at the bottom rotation of each pedal stroke, just like the day prior. The pain, however, wasn’t as pronounced as it had been the previous day. Irrespective, I still had concerns. If I was starting my day like this, how would I be in another 20, 30 or 40 kilometres? On a positive note, I was out of the city which reduced the frequency of the agonising pain that occurred when I was stopping and starting. The rain was distracting me too. I had started my day with a drizzle that only got heavier, shifting to hail and thunderstorms at times. The further I pedalled the more practice I had at reengineering my pedal stroke to deal with the knee pain and discomfort. I tried to keep a constant rhythm. I didn’t get out of the saddle at any stage and I pedalled down each hill to avoid the stops and starts. As long as I kept a continuous rhythm, I could manage the knee. That day I went 19 kilometres off course and had two flat tyres, attributed to the unrelenting rain. One flat I couldn’t even change because my hands and fingers were too cold from the rain and hail. Luckily, Alice was only 25 minutes down the road and could drop me back at a bike shop in Cambridge. With this delay I was facing another day of riding after sunset. I got to my final destination for the day, Tokoroa, after 226 kilometres of riding. I was saturated and shivering when I got to the motel. Boy, did I enjoy that hot shower, despite the limited water pressure. Reflecting on my 13-day journey, this day was probably the toughest, physically. I couldn’t really pedal properly and I couldn’t get out of the saddle to stretch the legs from time to time. I climbed 1,800 metres across 226 kilometres and it rained and hailed, causing me to shiver constantly throughout the day. However, I knew my day was easy in comparison to those young people with cancer I was raising funds for via CanTeen. The CanTeen effect was a massive mental motivator throughout the 13 days. This was the scene after I’d broken 3 tyre levers in an attempt to change my rear tyre with freezing cold hands. When I set the itinerary for Ride the Long White Cloud, I anticipated rain, but I hadn’t considered back-to-back days of unrelenting rain. Perhaps that was a good thing. As mentioned, the third day was by far the toughest: riding with an injury, punctures and a 19-kilometre detour in miserable weather. When you’ve been rained on all day, waking up the next morning to a pour is rather testing. I knew it was coming on day five. The night prior was the first time I’d looked at the forecast, and the rain was going to be heavy all-day long. The type of rain you normally wouldn’t even contemplate going out in. This was also the first day back on Highway 1. It was Saturday and we were away from the top of the North Island’s logging industry, so I was hopeful of less trucks, at the very least. I was saturated within minutes of riding. As the sun rose behind the thick layer of clouds, the terrain looked quite incredible, although it was hard to gauge. There was so much mist from the low-lying clouds and rain. A lot of my riding until that point had been rolling country side. Now I felt like I was entering a new world. And I was – volcanic territory. While the trucks had definitely become fewer in numbers, the ones that passed would completely drench me. I started to feel unsettled. My left calf was starting to cramp. I had been pedalling in a unique way the entire previous day and I’d clearly used muscles in obscure ways to manage the knee. Alice came up behind me about 30 kilometres in and followed me to ensure cars and trucks would once again give me a wide berth. We made it to Lake Taupo 65 kilometres later, which is a beautiful lake occupying an extinct volcanic crater. That day we could hardly see the water or the beautiful mountainous landscape. We pulled into a café. I was shivering and needed to get out of my clothes. I got changed, had a coffee and assessed the weather. I couldn’t ride all day long on Hwy 1 in torrential rain. My visibility had been non-existent at times leading into Taupo and the heavy rain and cold air was a killer. I’d trained in Wim Hof cold therapy techniques for over 6 months, but being saturated with constant wind chill is a different story. While it had rained constantly the day prior, day four’s rain was non-stop heavy. The forecast said heavy showers would become rain in the afternoon. I made the executive decision to wait for the “rain” and use some precious hours during the day to get some much needed work on my legs. I rang five different physiotherapy and remedial massage businesses in the Taupo area. No one could see me until 3 pm. Luckily I discovered that the Taupo Hot Springs were only 10 kilometres out of town. They had massage therapists and hot springs too! What a bonus. I rang with excitement. Someone could see me at noon. Double excitement. It was just after 10 am so by the time we drove there, I had an hour to bath in the hot springs before the massage. Looking back, that heavy rain that caused another delay in my itinerary was a blessing in disguise. While New Zealand roads and weather conditions had given me a beating over five-and-a-half days, the magic of the hot spring water and a VERY DEEP tissue massage was healing. 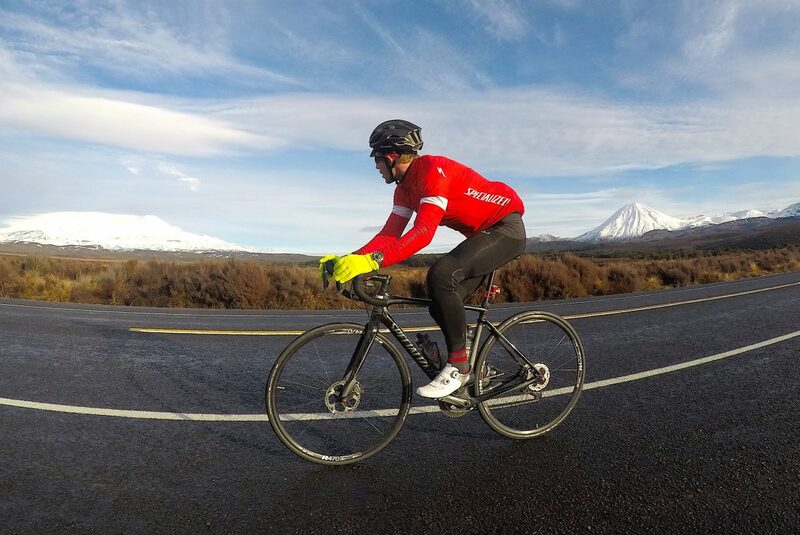 I did ride with very heavy legs that afternoon, 53 kilometres from Taupo to Turangi, and then the following morning, but my legs had received some invaluable treatment they so sorely needed. Getting out of the water after an incredible hot spring experience. Highway 1 becomes the Desert Road, a magical terrain that is like something from another planet. Often the Desert Road is closed due to extreme weather conditions. On many other occasions the visibility is so poor and you can’t see much else but road and desert wasteland. 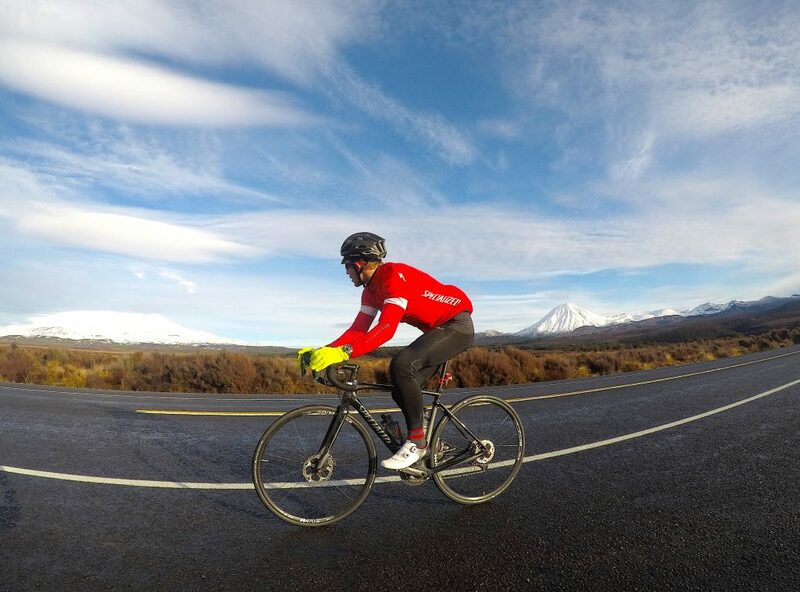 However, on a clear day, like the morning I rode through the area, the winter scenery is spectacular, with the three active peaks of Mount Tongariro, Mount Ngauruhoe, and Mount Ruapehu were activating my retinas like never before. When I woke up on Sunday morning the 23rd of July, I was energised. While I had heavy legs from the deep tissue massage the day prior, there was no sign of rain, my knee felt like it was slightly improving, and I had the Desert Road on my doorstep. For the first 20 kilometres I was on roads that appeared to be flat, but it was actually a gradual incline I later discovered, during my post ride analysis. I was also confronted with my first unrelenting head wind. Not a massive force, probably around 15-20 kilometres an hour, but noticeable. It didn’t bother me, however. I was rain free, the road was proving to be very quiet on a Sunday and I was about to be confronted with some magical scenery. The rain on the previous two days had completely disrupted my vision and enjoyment of the landscape. Now I had a clear view of incredible snow drenched mountains. The vast and open desert terrain gave the mountains a unique platform to demonstrate their volcanic landscape. The sun coming over the Kaimanawa Range popping through a broken layer of clouds would reflect off the snow, arousing my visionary senses like never before. I was literally awestruck by Mother Nature while doing one of my favourite things in the world. Riding my road bike. As I found myself exiting the majestic landscape, I smiled. I’d never been so happy to ride uphill with dead legs into a head wind. If there was ever a moment in time where I wanted to be slowed down, this was it. Another 10 kilometres down the road I was back into the rolling country landscape I’d become accustomed to. “Did I dream that stretch of road?”, I pondered. The contrasts in landscape from one moment to the next was so profound I found myself thinking that my time on the Desert Road was on a completely different day, when I arrived in Palmerston North. The scenes on the Desert Road were just incredible. When I hobbled into Fidel’s Café on Wellington’s famous Cuba Street on Monday the 24th of July to meet Alice for a quick bite, I couldn’t help but feel a sense of elation. My operating rhythm had been the old footy cliché: one town and then one day at a time. However, now that I’d reached a milestone in the journey I couldn’t help but reflect a little on what I’d just accomplished. I’d ridden one Island of New Zealand through some seriously harsh conditions. That evening I stayed at my cousin Mark and partner Shelby’s house and caught up with cousin Dean and his family. Mark cooked a roast, made my favourite chocolate cake and he’d even booked me a massage before dinner in his local Upper Hut area. It was a nice warm welcome to Wellington and a great opportunity to spend some time with family, albeit rather brief. I wore a black armband into Wellington in memory of my second cousin Lee Campbell whose life was tragically taken on United flight 811 in 1989. The ferry trip from North to South was a welcome break to my routine. While the morning was highly logistical, I did enjoy not having to put on lycra to conquer another 200 kilometre day. The sun was rising over the Wellington hills as I sat perched in front of the ferry to Picton. I waited for the cars to load as bikes go last. For the first time since planning this trip, I really started to contemplate what now lay ahead. Many people I had spoken with had painted the picture of the North Island being a breeze in comparison to what I would encounter on the South Island. If they were correct, how would I make it through this ride? I’d already encountered feelings of doubt, especially on the third day. My knee injury currently had me limping off the bike and fatigue had set in. The ache in my knee while lying was causing a highly disrupted sleep, which added further woes to my ability to rest before another round of pedalling. Yet despite the nullifying thoughts, I was excited. I had heard one consistent message above all others: the scenery on the South Island would be incredible. I’d never been before and if it was anything like the Desert Road, I’d be in cycling wonderland. The Specialized Roubaix and I waiting to board the ferry to Picton. The South Island set the scenery bar very high, right off the bat! I had some time to analyse maps while on the ferry and I noted an opportunity to not only cut 10 kilometres off my proposed 120 kilometre journey to Nelson, but also avoid the highway for a good chunk of the trip. This became a very good decision. On previous days when my Wahoo had directed my journey parallel to Highway 1, I’d find myself on dirt or gravel sections of road. Not this time. While I was spoilt for weather on this particular day, including a rare opportunity to take off my leg warmers, the scenery was nothing but spectacular. For 36 kilometres I rode on beautiful undulating and winding roads, along a bay area where less than a handful of cars drove past me. The sea water was like a crystallised lake with reflecting mountains from across the bay. I would pop out of a small range into a town that shouldered a beautiful inlet and then I would climb again into the next section of perfectly timed ascents and descents. Outside of the gritty surface I would have thought some cycling guru had built this section of road. When I started approaching a town called Havelock I could see the T-intersection where I would be introduced to Highway 6 for the first time. Before I had time to acquaint myself with my new pathway to Bluff, a mega logging truck drove past. A reminder that the roads were still extreme at times. I proceeded through formidable gullies and over some huge mountains. As the sun disappeared behind the pine forest peaks that afternoon, the landscape alone started to make me feel incredibly small. “I’m in a much different place now”, I thought. This was still New Zealand but the conditions were vastly different to anything I’d seen on the North Island. Getting to know my new terrain, South Island of New Zealand. 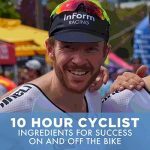 Over the previous 8 days I had been developing some habits to get me through the long days in the saddle. With many distractions along the way, I was yet to synchronise all my habits into one symphony. On Tuesday the 26th of July, my 36th birthday, it all came together. I’d learnt to always leave my Wahoo on map mode, with the map zoomed out to a certain level, so I could see upcoming intersections or towns approaching 2-3 kilometres beforehand. I could see my speed in the corner of the map, but nothing else. If I wanted to see heart rate, distance travelled, time elapsed or anything else I would have to change screen modes. This would become a reward during the day. My Tudor watch, provided by Watches of Switzerland, would be my time keeper, as I played both time and map games to initiate a reward. That reward may have been a drink, getting out of the saddle to stretch the legs, or perhaps taking a bar out of my rear pocket for something to eat. I’m not exactly sure what thoughts filled my head between the games. I do recall being amused on multiple occasions, by a $200 investment I’d made before the trip. It was a “bone conduction headphone” device that plays music into your ears without covering your ears. It uses vibration technology, enabling the headphone to sit along the ear bone shaft, transporting sound into your ear drum without completely covering the ear. “What an awesome companion device for my trip”, I thought naively before being confronted with the real New Zealand challenge. I wanted all senses on high alert given the unfamiliar roads, terrain and trucks. I never took this item out of its packaging, and perhaps it was that alertness I required which made my thoughts less deep seeded and my present moments more pronounced. I remember each day exceptionally well. I’d also become quite automated in my stops for the day. Typically, I would like to get 60-80 kilometres in before a coffee stop and 100-130 kilometres in before lunch. Alice would meet me for lunch, but no longer would I sit and chat. She would see me arrive and pop out to ask me what I wanted. She ordered my meal and coffee while I did some light stretches outside. I’d walk in, have my coffee, my food would arrive, I’d eat quickly and then I’d be off. Alice would try to communicate with me but I was either in a zone of deep focus or in a fatigue hole. Stopping for too long not only caused my legs to cramp up and the knee to stiffen, but it also meant I was losing precious daylight by the minute. I’d already ridden in the dark on three occasions and I wanted to avoid that. The consistency of hearing trucks coming from behind over the previous 8 days had clearly had some effects. On many occasions I would turn around to assess the distance of an approaching mega truck, only to see an empty road behind me. This mirage lasted for the remainder of my journey. Overall, my ride from Nelson to Reefton will be remembered as a really tough 211-kilometre day in the saddle. Yes, I had found my rhythm, but in the back of my mind I was also dejected, knowing that I had only really started penetrating the South Island on that day, with a long road still ahead of me. If I really wanted to reach Bluff as quickly as possible, I would have taken Highway 1 (or parallel offshoots) from Picton, but because I wanted some quality scenery, I’d spent the previous afternoon riding from the east side of the South Island to the west side. That day I also dealt with an exploding front tube after only 7 kilometres, a loss of bodily functions as I wet myself thinking I could hold on for a while, and I rode on the coarsest roads I had been on to date. The day was windy and I wrapped up my last 30 kilometres in the rain. A slight taste of what was to come the following day. My operating rhythm also included some fire time, assuming one was in vicinity. Out of my 13 days of Ride the Long White Cloud I had five completely rain free days and three days of heaving winter rain. My journey from Reefton to Whatoara, which became Reefton to Ross, was the last of those three days. The bitter taste of the back-to-back rain filled days in the North Island was still in my mouth, and when I rode in drenched the previous evening, I thought I could even be getting used to it. However, the next morning I woke up to pour – yet again – which finally put me on the edge. I sat there on Wednesday morning the 27th of July, sipping my coffee slowly, hoping the pour would subside. On occasions Alice would find motels with separate rooms. That morning she was tucked away in her own bedroom, so I contemplated sitting and waiting, perhaps even turning on the TV for the first time. Once again, the need of daylight provided the push I needed to start pedalling. About 30 kilometres into my 75-kilometre journey to Greymouth, where I would meet Alice for a morning coffee, I received a call. The local Greymouth Newspaper wanted to meet with me to write a story. I’d received an identical call from the Westport News the day prior, however we ended up bypassing their town to save me an additional 20 kilometres of riding. The day prior I’d also been approached by a man at my lunch stop in Murchison, who had read about my story in the Christchurch newspaper. My business partner and brother-in-law, Jonas, had sent out a press release to the South Island news outlets and they’d really embraced the story, despite me really having no clue about what was being published and where. I told the Greymouth news I’d be approaching in a couple of hours and which coffee shop to meet me at. By the time I arrived I was freezing cold and shivering. Alice took the interview on my behalf, while I proceeded to the café toilet to peel off wet layers of lycra sticking to my skin. I used paper towels to dry my cold, wet skin and then went outside for a quick photo with the journalist before heading back into the café to have my coffee. I sat there staring at the outside environment. Rain, dark clouds and very poor visibility. I really didn’t want to go back out there. I had a quick look at the weather and it was not giving up all day long. I would at least wait until my shiver has subsided, I decided. After I finished my coffee I may have doodled for another 30-45 minutes before giving Alice the nod, indicating I would meet her for lunch in Hokitika 40 kilometres down the road, where we would decide on our next sleeping destination. I took off in the rain. Only a few hundred metres down the road was an industry rail track that cut diagonally across the road, straightening up into a port area that sat beside the town. My front wheel wedged into the rail line, forcing me to the ground fairly hard. A fall when you’re travelling at 15-20 kilometres per hour is often worse than one at higher speeds, because you don’t slide or skid when you hit the ground. You just fall and absorb the impact. While I was bruised, sore, and bleeding from my leg and hands, I wasn’t seriously hurt. The bike, however, was a different story. Nothing major, but I’d bent the rear hanger, which disabled my ability to change gears. I needed a bike shop! Alice took me back into town. Two bikes shops exist in Greymouth. One was closed and in the other shop the mechanic had just left to head to Christchurch. For 10 minutes we were lost. Then some magic. Scott the mechanic walked back into the store. He left something behind. We told him what had happened and where we were going. He fixed my bike on the spot and insisted that we don’t pay because we were raising funds for CanTeen. I continued my ride to Hokitika in the rain. It was now too late to get to Whataroa so we ended up in a tiny little place called Ross, 145 kilometres into what was supposed to be a 220-kilometre day. Despite the rain, I was fine to keep going that day but the lack of towns were the conundrum. We were entering new territory. A picture of Scott and I from Colls Sports World Greymouth. What a legend! While I’d been looking at the daily forecast on the days of rain, I’d never looked more than 24 hours ahead. I didn’t want to know, just in case it was bad. When Scott was fixing my bike he told me that I had three clear days ahead of me following the current downpour. Bloody amazing! That night in Ross I looked at the forecast for the rest of the week. Three days of sun, how magnificent. But on the fourth day, rain. I was supposed to travel 220 kilometres to Whataroa that day, but I’d only managed to cover 145 kilometres. Where would I make up this 75-kilometres loss? That’s three hours of riding on a tight schedule with a new conundrum, being fewer towns. In addition, fatigue was setting in and my previous experiences made me hesitant to make any bold decisions. That night I had my worst sleep as far back as I can remember. While my knee had improved dramatically while riding, it was swollen quite badly and ached off the bike. My left ITB was also tightening up as I slept. It had been doing this since the North Island and getting progressively worse. While the pain in my shoulder and hip from the fall added further aches, the left ITB was the killer. I got out of bed three times that night to use the foam roller. I’d find super tense spots on my ITB and hold it here for periods, feeling the tension diminish, at least for a brief period. I wished I had pain killers that night. I’d purposely stayed off them up until the last few days of the ride, mainly because I was conscious of the adverse effects on your gut and bodily chemistry. However, after that night in Ross, they would be a constant. The entrance way to my 2 days of blue skies and snow-capped mountains. While I’d slept horrendously and my body was dealing with new levels of fatigue, I was energised once again by the skies that greeted me as I exited the motel room in Ross. I started most my days around 7 am, roughly 30 minutes before sunrise. While it was dark, it wasn’t pitch black, and I knew daylight was just around the corner. I could see the stars and felt the cold like never before. I was now in the south part of the South Island. The cloud layer on the previous two days had disguised the cold temperatures. Nevertheless, the sun would be hitting my back today and I was heading for some incredible South Island scenery. 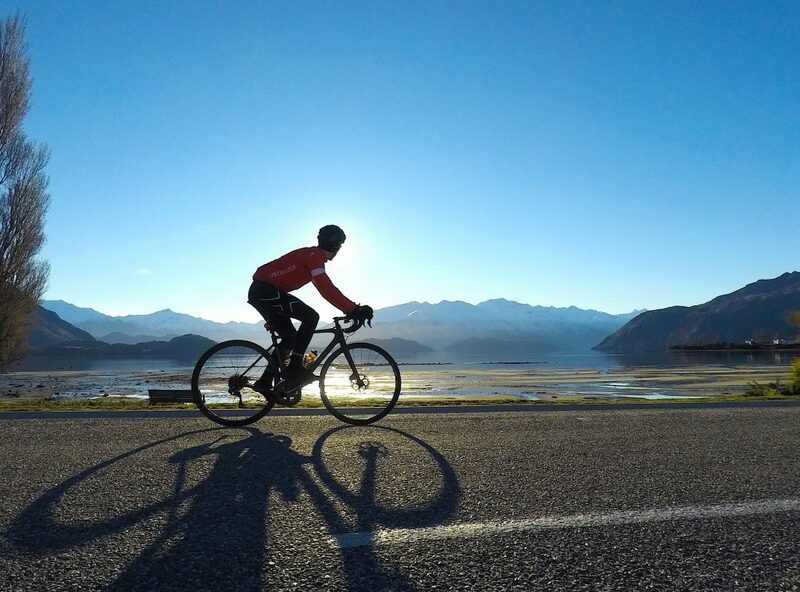 Riding from Ross to Wanaka over that two-day period will be remembered as the best two days of cycling in my life. 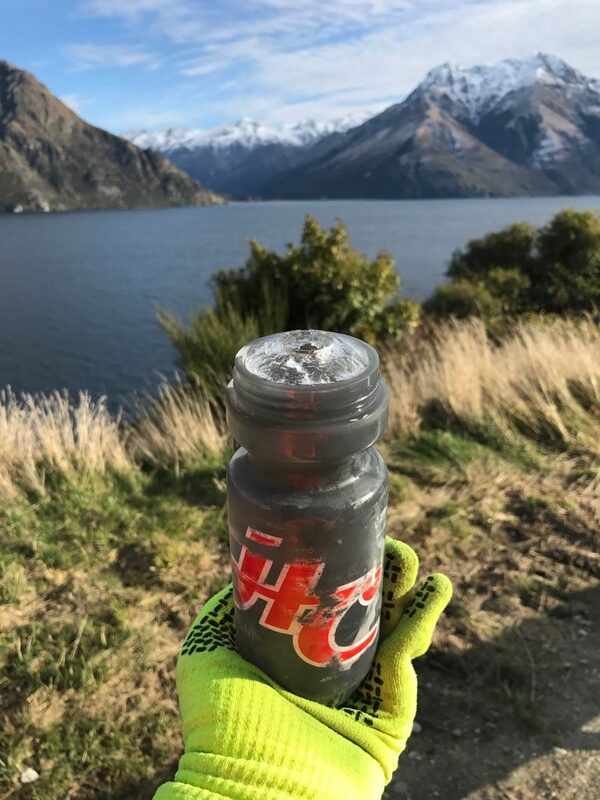 I road through the Fox and Franz Josef Glacier Region; the unforgiving Haast Pass with 18 percent inclines and -5 degree temperatures; and along Lake Wanaka and Lake Hawea with snow-capped mountains reflecting off the glass-like water. I confronted the “black ice” on the bitumen and incredibly cold, howling winds blowing off the mountains. I pedalled across countless bridges with blue sky water rushing just below my Schwalbe tyres and didn’t require any misfortunate stops along the way. It was beautiful, harsh and extreme all wrapped up nicely into a little 48-hour package. When I rolled into Wanaka, I was excited. Not only had I just completed back-to-back days of incredible riding, but Wanaka itself was a peach like no other. Alice still says today that it’s the most beautiful place she’s ever been, and if I hadn’t entered Wanaka as the sun was setting and left again before sunrise, I just might have agreed. Rolling into Lake Wanaka as the sun was setting over the beautiful snow-capped mountains. From Wanaka it was 270 kilometres to Bluff. 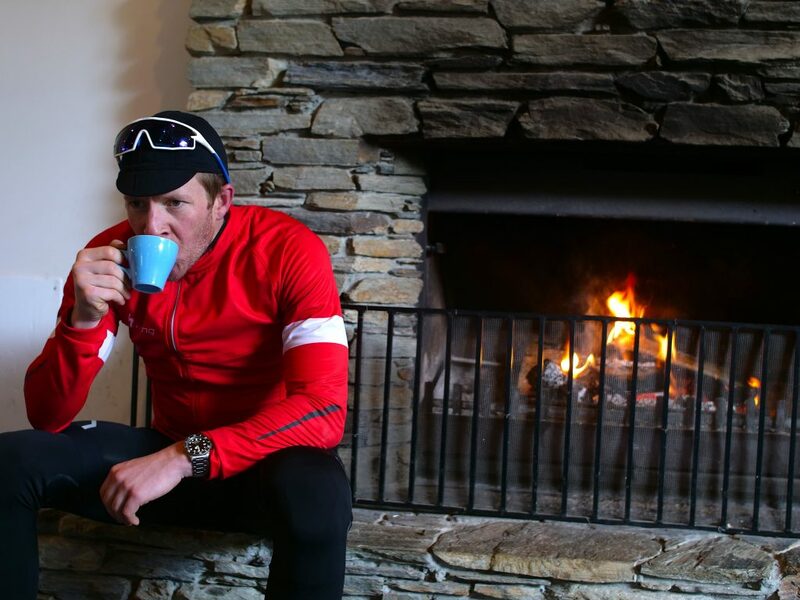 The proposed route included over 2,000 metres of climbing, riding in the dark on icy and undulating roads, spending hours in subzero conditions, and doing it all with over 2,000 kilometres in the legs already. I’d been thinking about tackling this ride the day prior and I’d told Alice “let’s see how we go on the day”. However, when I woke up from my disrupted sleep at 5 am, I felt ready. I had breakfast, put my gear on, and sat on the couch staring at the Roubaix while sipping on my coffee. There was no turning back, I’d made the decision we were going all the way to Bluff today. I left at 6 am, the earliest start I’d had on my journey. The temperature on my phone said -2 and I was about to gradually, and then rapidly, climb from 300 metres to 1,100 metres. The temperature in Queenstown that morning was -5, where I would be passing 70 kilometres up the road. I will never know what the temperature was at the top of the Crown Ranges before I descended into Queenstown, but never in my life have I been so cold. In fact, I rang the Met Service the following day, asking if they could provide a temperature for the Crown Range. Apparently, a temperature unit for the Crown Range is on their priority list and they’d tried to install a gauge recently. However given the extreme cold temperatures, the cement required for installation had not been able to dry, so they postponed the installation until summer. All I could obtain from the contact at the Met service was that it would have been colder than Queenstown. With gusty mountain winds blowing and the temperature being -5 or lower, I descended 800 metres into Arrowtown and then Queenstown. I’d planned on stopping in Queenstown for a coffee, but I was too cold to stop. My entire body felt like it was an ice block and my hands had never been so numb despite the dual glove action. As I left Queenstown, pedalling along Lake Wakatipu I felt the sun peaking over the ranges, hitting my side and back at times. I finally stopped to take a drink. My arms and hands were so frozen there was no way I could squeeze water out of a bottle while riding. Both my water bottles were frozen like bricks. I knew that one had turned slushy about 20 kilometres into my journey but I hadn’t inspected it since, nor had I tampered with the rear bottle. Outside of a very small amount of liquid, I had ice bricks in my bottles. A tell-tale sign of what I’d just ridden through. I continued on until I reached a town at the end of the lake, called Kingston. There was a café just outside the town on Highway 6 which was ideal. I didn’t want to backtrack at all today. I’d been riding 105 kilometres before stopping and without much of a drink. The café had a fire place. 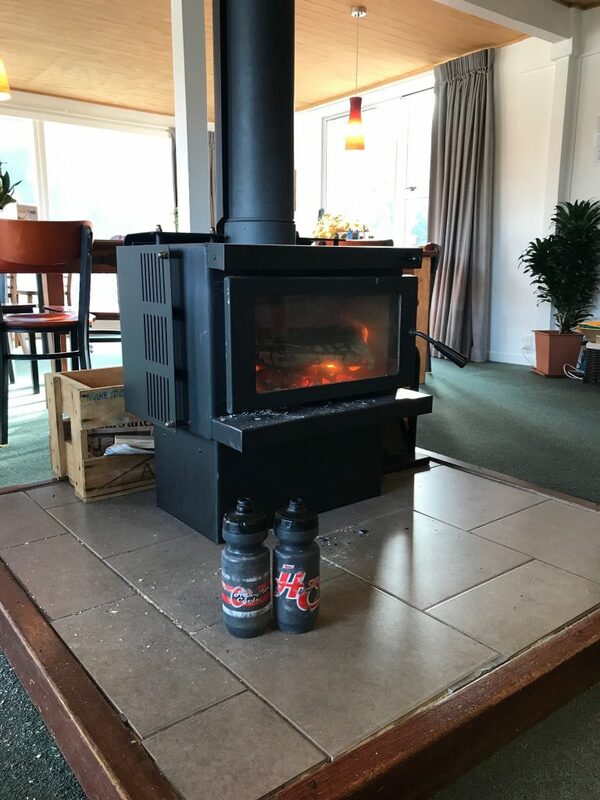 I put both my water bottles next to the fire in an attempt to get my water back. …Then unfroze in front of a fireplace in Kingston. It had taken almost the entire length of New Zealand, but 10 kilometres down the road from my pit stop I was finally stalled by a good old fashioned sheep crossing. I sat there and embraced the delay, firstly because the sheep dogs were demonstrating their rounding maneuverers, managing the sheep migration perfectly. Secondly, because I had developed a fond relationship with the sheep over my journey. Multiple times throughout every single day I would ride past paddocks of sheep. The sheep are obviously used to cars zooming past at 100 kilometres an hour, so they take no notice. My passing by however caused a much different reaction. One sheep would look up from its grazing position – typically the sheep closest to the fence line. The soft sound of my pedal stroke and tyres on the coarse roads would be the attention grabber. The sheep would typically take some time to locate my physical presence. Once I was spotted it would proceed to run into the middle of the paddock, triggering a sheep tsunami from the fence line to the other end of the field. Even though I knew the flow of events after the first couple of days, I still enjoyed watching this unfold every single time. As the last sheep migrated into their new paddock I was just thinking about Bluff. I’d made excellent time that morning, the sun was now on my back and the road angle appeared to be predominately in my favour. I didn’t look at my distance travelled at all that day. I didn’t want to lose my focus. Alice didn’t pass me in the car until mid-afternoon and she couldn’t believe how far I’d ridden, although she wasn’t aware until later that I’d broken the rules and started riding well before sunrise. I had one last coffee and cookie stop at a town called Limehills, roughly 70 kilometres from Bluff. I’d been eating well for most of the ride, including a mountainous volume of my favourite Paleo Bars, provided by partner Blue Dinosaur, but I’d also developed a cookie fetish half way down the South Island. The New Zealand choc chip cookies were magnificent. Interestingly, the emotion I had on those final 5-10 kilometres wasn’t anything I’d anticipated. While I felt some excitement knowing that Alice and I could now spend a couple of days in Queenstown together and I wouldn’t have to get up and ride in the rain the following day, I also I felt sad. The 13 days in New Zealand were incredible. Each and every single day was an adventure like no other. The scenery was just spectacular. While I was fatigued like never before, I was at peace. The operating rhythm I inadvertently fell into was incredibly therapeutic, cleansing the mind and soul. While Alice was certainly emotional when I rolled into Bluff, my sadness morphed into elation. 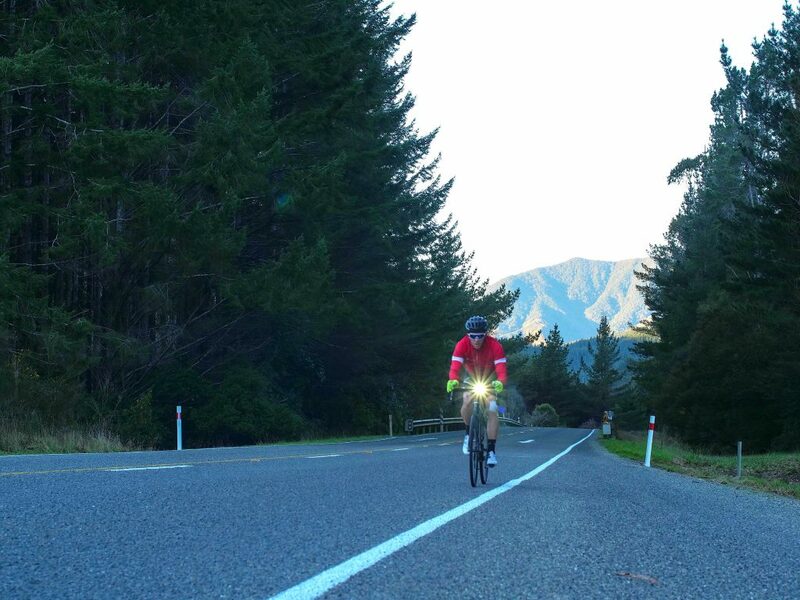 What an achievement, riding the length of New Zealand in the middle of winter, over 13 glorious days. Perched on a hill above the famous “as the crow flies” street sign that resides at Stirling Point (the very tip of New Zealand’s south), sat a restaurant. Still dressed in lycra, Alice and I proceeded there for some of New Zealand’s famous Bluff oysters and a couple of well-deserved central Otago Pinots. Relieved, tired and a little sad that Ride the Long White Could was over. The South Island of New Zealand is world class beauty on a platter. It doesn’t matter what people tell you (because words can’t describe the scenery), until you’ve seen it for yourself you’ll never know. If you’re an Australian reading this, your mindset may be a little like mine was. We complain about being so far away from everything, constantly fantasising about Europe, the Americas and other continents. I’m fortunate enough to have travelled through major portions of all those regions and also a lot of Asia. Putting sunny beach holidays to the side, the South Island of New Zealand is either on par or more incredible than anything you’ll ever get anywhere else in the world and it’s only a few hours away! To think there’s Milford Sound, Mount Cook, Christchurch and an array of other well-regarded spots still for me to explore, I just need to get back there as soon as possible. Winter really is an incredible time of year. Some of the unbelievable scenery I saw during Ride the Long White Cloud would not have been possible if I rode during any other season. The harshness, ice, snow and cold rainy days that constantly presented themselves across my 13 day journey endowed an extremity that added tremendous theatre and created memories I’ll cherish dearly for the rest of my life. The cold made me more present than I’d ever been. As Wim Hof states: “the cold is merciless, but righteous. It brings you directly into the depth of yourself. You’re not thinking, your emotions stop. You are just surviving, brought into the purity of your physiology and your soul”. The therapeutic outcome of my journey in New Zealand is testament to this statement. An adventure holiday with your partner could be a game changer. A typical holiday for Alice and I would be in one of the usual tourist hot spots, where we’d eat at the best restaurants, walk along the most scenic parts and other such touristy activities. While there’s still a lot of merit and enjoyment in those types of holidays, we only live once. Getting out of your comfort zone and REALLY seeing a country that’s close to your heart or you have interest in, opens a door to new experiences and life changing moments. Whether that be through the people you meet, the towns you stumble across, the landscape that surprises you or the moments of discomfort that require a team effort to prevail. Our trip was a beautiful two-week period that made us closer as a couple and made us fall in love with my partial motherland, New Zealand. A husband and wife getaway like no other. 13 days. Why so quickly? Do you have something against Kiwis? Good effort Cam, like the music, and the scenery! haha, thanks Robert. I am 1/2 kiwi don’t forget! Cam… an inspirational story that was superbly communicated. Superlatives fail to describe how incredible your physical & emotional commitment was to complete this journey against such adverse weather, horrendous traffic conditions and physical ailments. Fantastic support & care from your wife Alice whose emotion & pride while embracing you on your safe arrival in Bluff I believe was also felt by all those who followed and supported your worthy charity cause. A truly remarkable effort !! Man, that is a huge effort in the middle of winter. I take my hat off to you. Nice vid too! Thanks Tim, really appreciate the feedback. Great achievement and s fantastic story. I’ve alwAys wanted to do something like this. Well done gif making it happen. Thanks Stefan, appreciate the message. You should definitely go for it! Well done!! An adventure you’ll grow from and never forget. Thanks Craig. It’s great to have the man who was part of my inspiration see the story! Really enjoyed the read, completely agree with: “because words can’t describe the scenery” and Alice’s sentiments about Wanaka. Commend you on your effort but think you’re completely mad but in the same breath feel somewhat inspired none the less… thanks for that! Thanks for the comment Peter. Alice and I need to get back to Wanaka and the South Island asap. Although next time we’ll take the kids with perhaps a little less riding. Having toured both islands by car I’d love to do that. But I’d take longer, meander a bit for the scenery, and do it in the summer! Hi David, thank you for the comment. I’d love to do it by car now! My mother tells me autumn is a very pretty time to go. Thank you Richard, appreciate the comment! Great adventure… you need to write a book!